YaY!! We’ve updated our oldest daughter’s new room!! For the first time since our middle daughter was born, our oldest is no longer sharing a bedroom. We’ve always lived in houses with more enough bedrooms that they didn’t have to share; it was always our choice to have them share a room. We collectively decided that it was time for them each to have a little more space and chance to personalize their own spaces. It is a really big change for the two of them. Our oldest is 10, now, and our middle daughter will be 8, soon. They had shared a room for 8 years. In the name of truly personalizing the space for our daughter, we let her pick her new bedding, the paint color for the walls, etc. Transforming the room was quite a project. Since the former owners of the house used it as a “music room” I believe, it was carpeted, had white walls, and didn’t have a closet for clothes. We changed all that. It now has new hardwood floors, bright pink walls, plenty of closet space, and unique furniture. We still have a few small projects left to do in here, but I can’t wait to show you the BIG projects that we’ve already tackled. Mitch, our daughter, and I worked together to make this a great space for her to use and continue to grow into for the next few years. Now, for the reveal! I took a few pictures of the room as it is now! I’ll update again, when the accessorized vignettes are complete, too! Architecturally, it is a really interesting room with neat angles on the ceiling, and it is really big. In her room, she has a full size bed, a dresser, a vanity, an armoire, a desk, an armchair, a neat silver chest, and room to spare. Seriously, it is a BIG room for a 10 year old girl, I think. 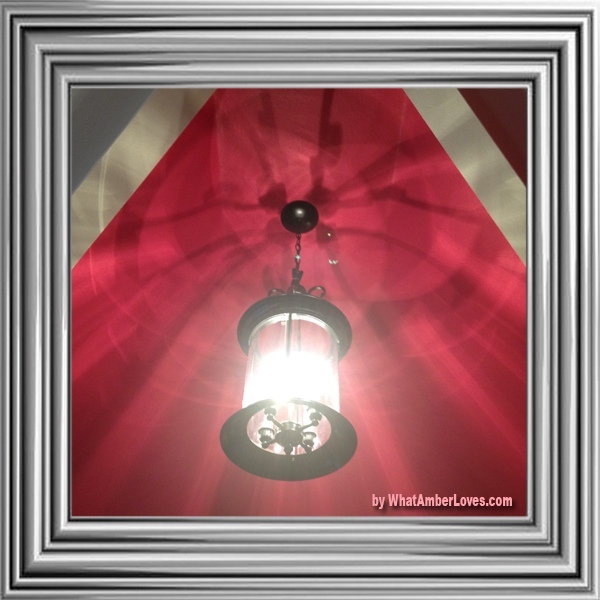 One of my favorite features is that we moved a light fixture that was formerly in our foyer, spraypainted it black, and installed it in a way that it really shows off the ceiling angles with how it bounces light around through its beveled glass panels. So, here is the fun silver chest that I mentioned. It is a gift from my grandmother. It has been in the family for a long time, but had been in storage for many years which ruined most of its original pale colored wooden finish. Awhile back, I coated the whole thing in silver rub’n’buff and gold leaf. (everything but the top surface.) Yes, really; all silver and gold!! Haha! Even though the package of craft product is labeled “Gold Leaf” in bold letters, it is in fact a metal leaf, not “GOLD,” as would be defined by a scientific periodic table of elements! As for the Rub’n’Buf, I don’t know whether there are any precious metals in there or not, but it is pretty! It is so easy to use! Just like the product says, I just rubbed the product onto the surface of the chest with a scrap of a old tshirt and buffed with another scrap; rub’n’buff. (Gold leaf: glue-ish medium known as sizing + leaf transferred using wax paper + spray sealer.) 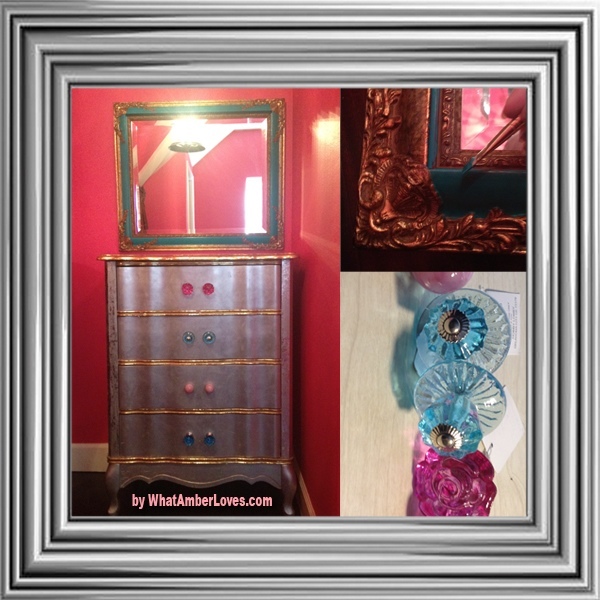 To personalize the chest for our daughter’s new room, we added a mix of new glass knobs in shades of pink and teal. 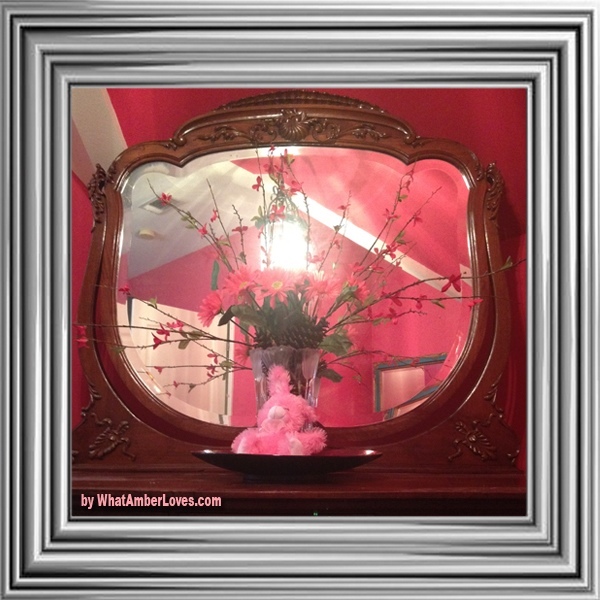 (found them on sale at Hobby Lobby) And, I repainted an old framed mirror to coordinate. She LOVES the set! YAY!! Our daughter’s new (antique) primary suite of furniture is also a gift from my grandmother. I slept in it at my great grandparents house as a child. It has been in the family too many generations to count! It dates back into early 1800s in Memphis, I believe, I’d have to re-read the provenace that my grandmother wrote for me in order to confirm. Regardless, I have great memories of the set having always been a part of my life… Now, my oldest daughter is using it. It will one day belong to one of my grandchildren or great grandchildren, I predict. 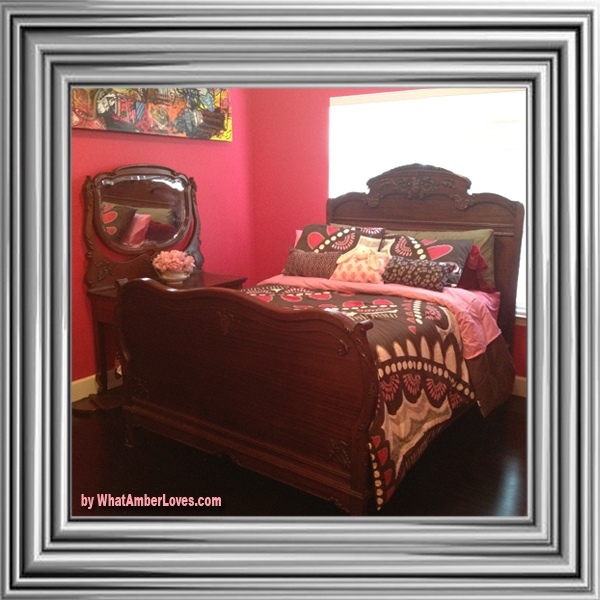 Here are few pics of the dresser, armoire, vanity, and bed that are the set. 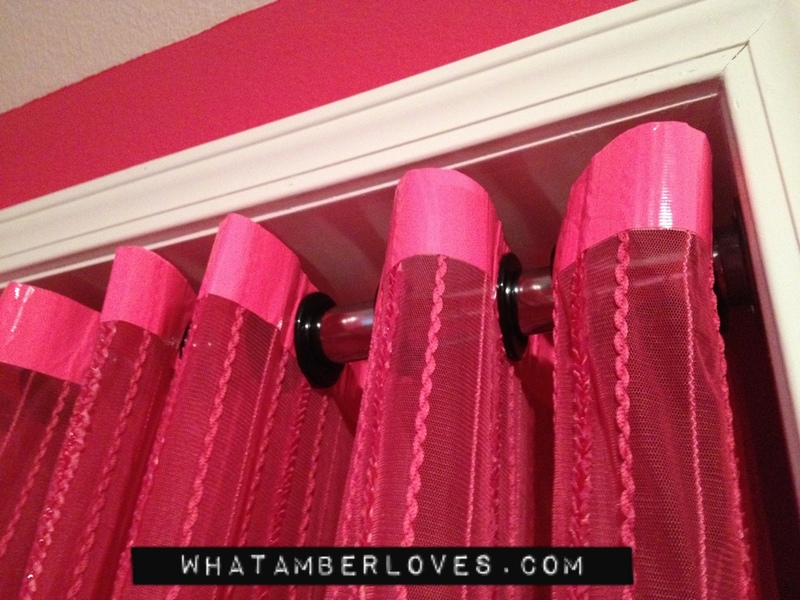 Update: In other hot pink bedroom news, I also finished sewing all of the sheers and curtain panels. See next photo…. 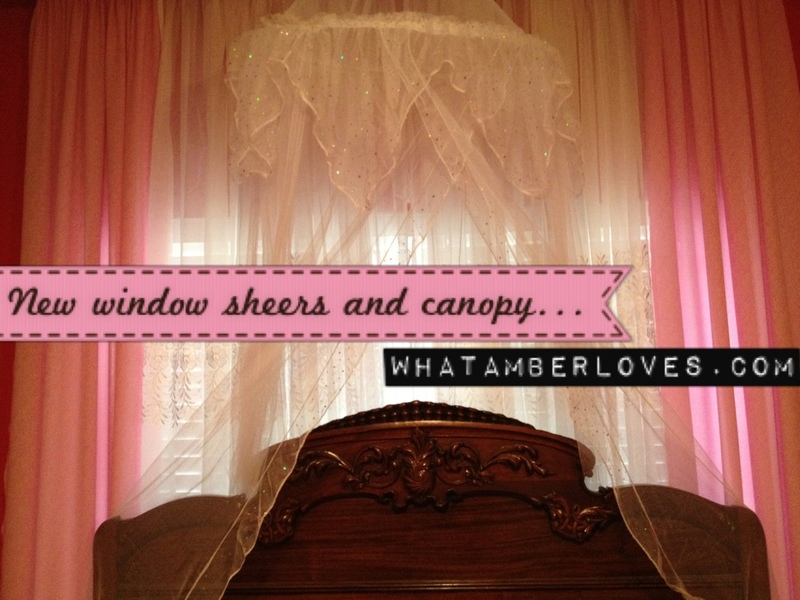 Aaaaand, for her hot pink bedroom, we bought her the little glittery mosquito net type canopy that she wanted…Ten year old girl, she is, indeed, wanting such a sparkly thing! Love her!! 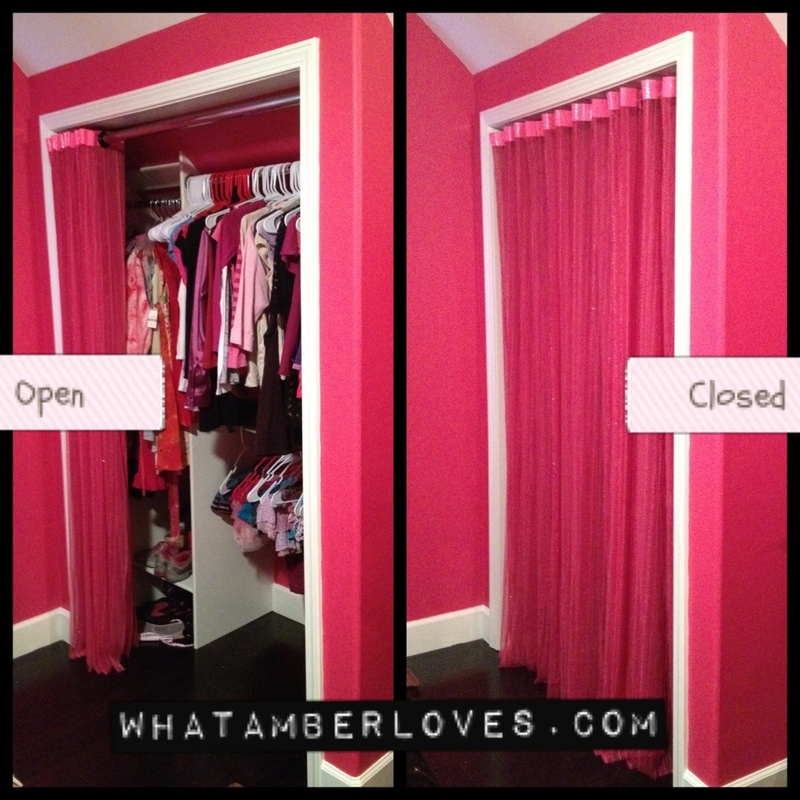 Our daughter made the “no sew duck tape and grommet curtains” for her closet. I hope y’all are having a great day! Thanks for reading our post and visiting our new project! We have a few other project posts related to this room! 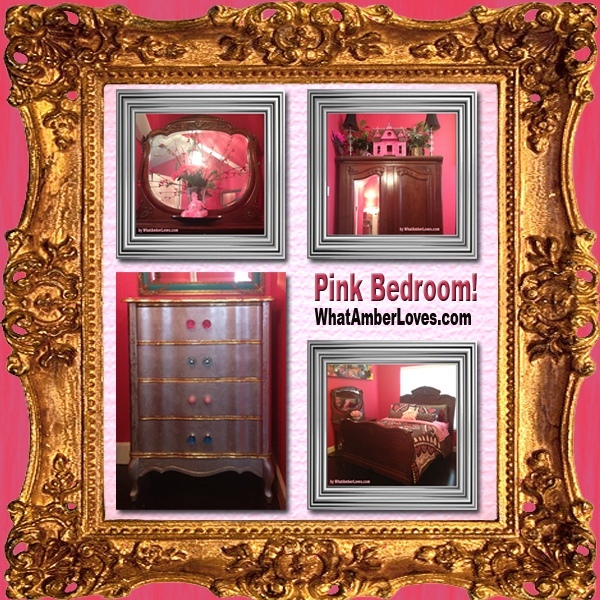 Posted on August 28, 2012, in Uncategorized and tagged antique, daughters, furniture, glass knobs, gold leaf, original paintings, Pink Bedroom, silver chest. Bookmark the permalink. 13 Comments. Your daughter’s room looks great! I love those paintings! Nicely done! Thanks for sharing at the All Star Block Party! Hot cha cha! She’ll be glamming in that pinkness. 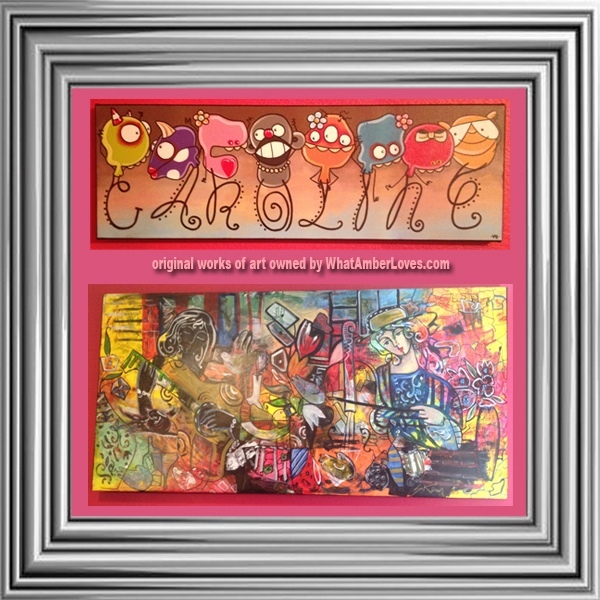 Amber, I just love Caroline’s new pink room!! I bet she just loved helping you paint and decorate!! I just love you and your family’s energy to decorate, cook, etc!! Thank you for sharing this charming room at Potpourri Friday! 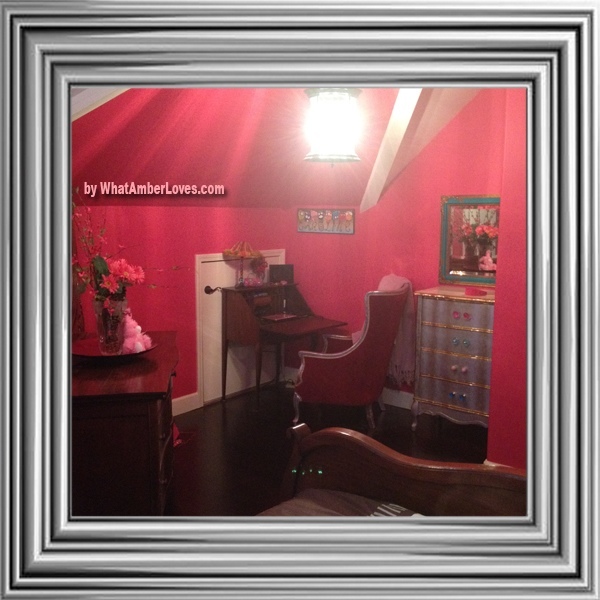 I love bright colors in rooms–this is such a wonderful shade of bright pink! And the antique furniture is just gorgeous. What a lovely room for a young lady. 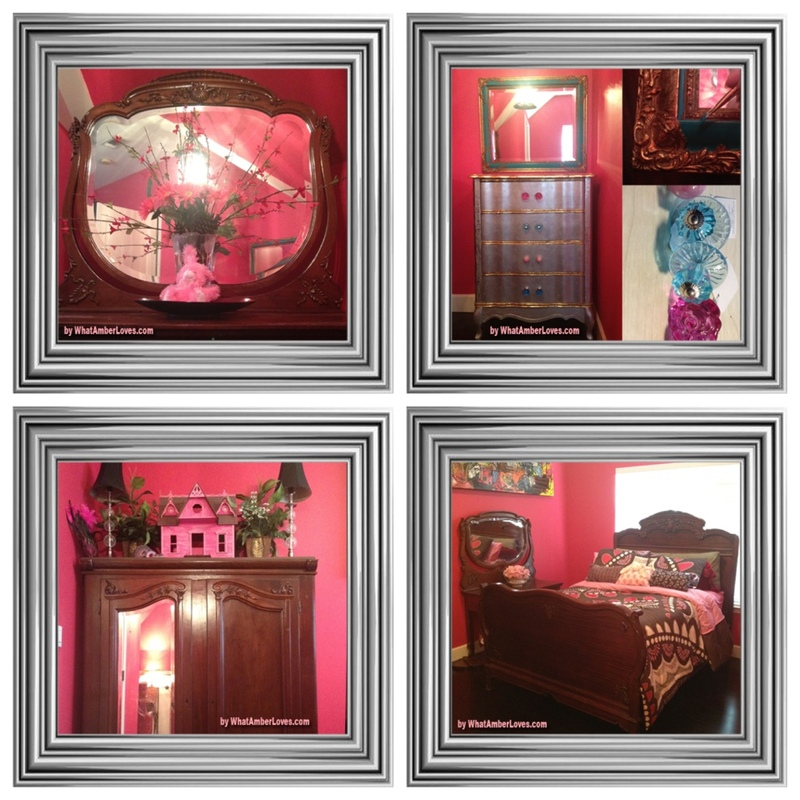 I love this bright shade of pink in this lovely bedroom redo–that’s one lucky girl who gets to live there! 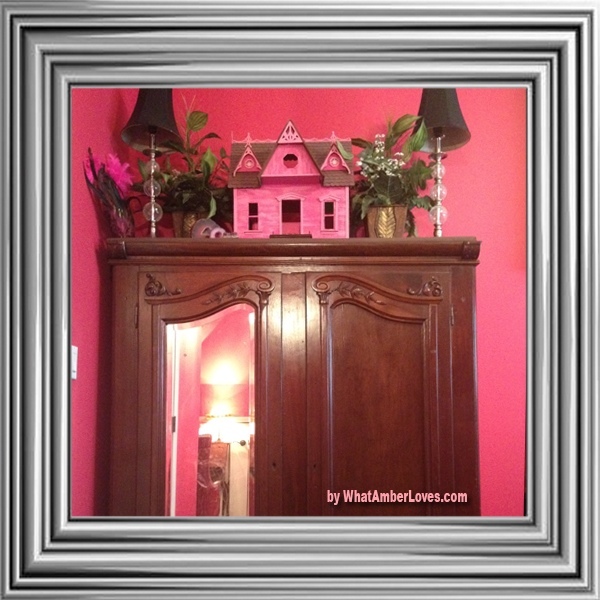 What a great treasure your daughter has in the antique furniture! Love the art work too! Thank you for sharing at All My Bloggy Friends last week. I can’t wait to see what you share this tomorrow!